Woman's Cave - located near Baia de Fier, is a natural monument containing concretiuni limestone, true original embroidery, which gives it a special note. Reserve the Speleological is formed Bat Room, which hosts numerous colonies of bats and Bear Gallery, here is the bear bones of the cavern. Cave woman, now fully electrified, has served as shelter for men since era Middle Palaeolithic. Scarisoara Karst - located in Bihor Mountains, the largest cave with ice in Romania and among some of the world and unique in south-western Europe, located at the altitude, has a glacier volume and a thickness of 20 meters, 75,000 meters Cubic, it has not melted again with all that has a length of about 3000 years. Closani Cave - situated at an altitude of 433 meters, at the foot of Tripura Mountains, a cave that has easily accessible lakes, fauna and many special limestone. Bears Cave - located 86 km from the town of Oradea in common Sudrigiu at an altitude of 419 meters, has a special Speleological architecture, here are the fossils bear the cavern, disappeared after the 15,000 years, with a length of over 1 km, the Cave Bear is endowed with formations of Stalactite and stalagmite. Wind Cave - located on the left side of Crisului Quick, near Suncuius, with a length of over 4 km, is the longest cave in Romania is crossed by a course of underground water that has left various signs of corrosion. Meziad cave - Speleological reserve located in Forest Craiului Mountains, one of the largest caves in Romania, with a length of 4750 meters on several floors. Tausoarelor Spring Cave - is situated on the slope left of Tausoarelor Spring Valley, near Barlea top, the cave with the greatest depth of 432 meters with Romania Cave Spring Tausoarelor owns underground galleries with a total length which stood at 16.5 kilometers, a Hydrography underground and a varied fauna. 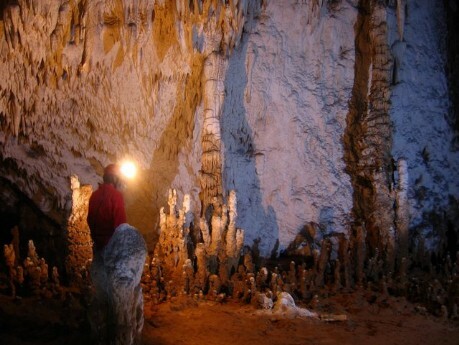 Jgheabul Zalio Cave - to come Paraului Orb, with a level difference of 242 m, what a place to second place in Romania. Huda's Pap Cave - there are two hours Salciua, in the Apuseni Mountains-Trascau, which stretches over a length of 2 km near the river an underground, with lakes and waterfalls.